A somewhat belated note on the June birthstone you’re least likely to casually come across. It’s an unusual and pretty rare stone called Alexandrite. Alexandrite is a variety of chrysoberyl, a more common form of chrysoberyl is cat’s eye. The more common, though still striking, cat’s eye chrysoberyl. Chrysoberyl are oxide minerals and despite the name, bear no relation to beryl gemstones like aquamarine and emerald. 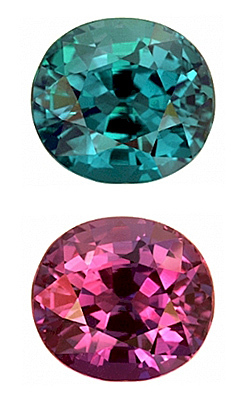 What’s amazing is that alexandrite changes color depending on the type of lighting it is viewed in. This happens when chromium atoms replace some of the aluminum atoms in the chrysoberyl structure. Chromium strongly absorbs light in the yellow range of the visible spectrum. So you don’t really see any yellow in the stone. In daylight the stone looks green, or sometimes blue, in incandescent light it looks raspberry red or purple. Since the stone isn’t reflecting anything the yellow part of the spectrum, in daylight we see it as greenish, since we’re seeing it reflect back most of the spectrum. In incandescent light, which doesn’t put out the range of green/blue light for it to reflect in the first place, we only see alexandrite reflecting back the red part of the light spectrum. Technically any chrysoberyl exhibiting this color shift is considered alexandrite, but generally the richer the color and contrast the more valuable the gemstone. (I’ve seen plenty of pale cat’s eyes labeled alexandrite.) The color change is more visible in thicker stones. It’s a pretty rare stone, and it’s almost never found in stones larger than 3 carats. Not shockingly, it’s also one of the most expensive gemstones in the world. Just to reiterate, this color change is all about the way the atoms that compose the stone absorb light and the wavelengths of manmade lighting. It has nothing to do with the angle at which the stone is viewed, like iolite which goes from violet to grey depending on the angle, nor is it a chemical change. How can you not love a piece called the ninja butterfly brooch? The lovely alexandrite body is just a bonus! 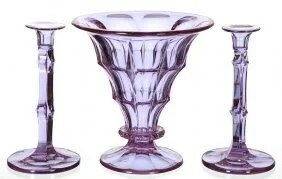 Alexandrite glass also exhibits a color shift due to neodymium’s absorption. It looks purple in daylight and blue under fluorescent lighting. This same shift appears in some imitation alexandrite. 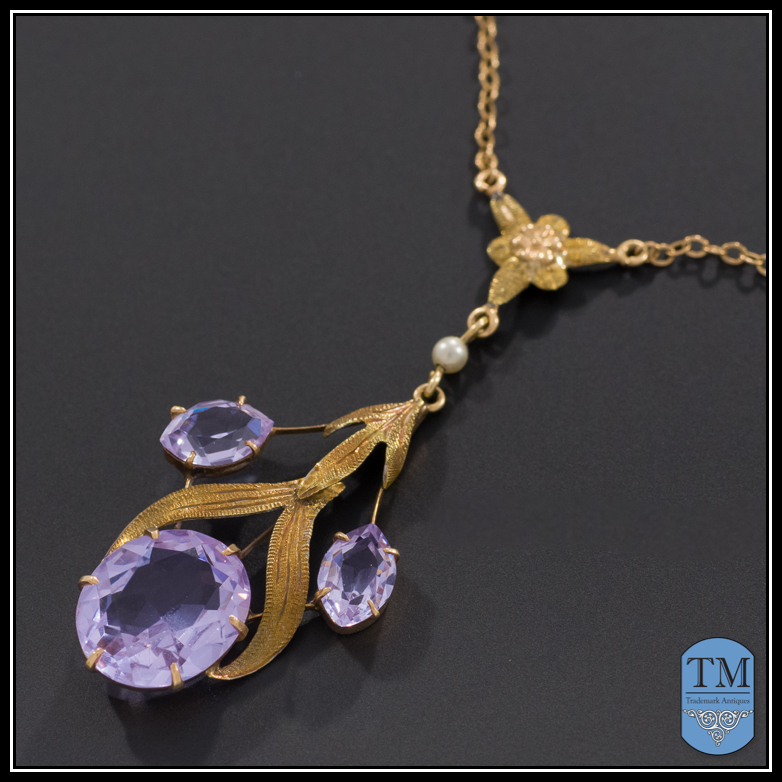 A really pretty deco necklace made with alexandrite glass. The link takes you to photos of it in different lightings.